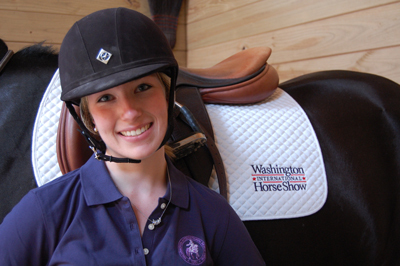 Washington, D.C., August 18, 2011 - The Washington International Horse Show (WIHS), a leading national equestrian event based in Washington, D.C. since 1958, is proud to announce Shannon Miglarese of Bethesda, Maryland, as Youth Ambassador of the 2011 show. WIHS received many applications from very qualified students in the DC Metro area and beyond. 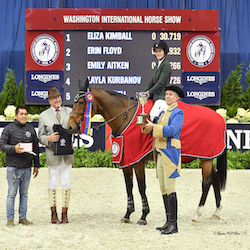 Miglarese will serve as the third WIHS Youth Ambassador following Jamal Brown and Anna Rossi. Miglarese, 17, will begin her senior year at Walt Whitman High School in Bethesda in September. Last year she was a member of the WIHS Junior Committee and served as an intern for WIHS Kids’ Day. She also is a JustWorld International Ambassador. Miglarese has attended the Washington International as a spectaor for many years with her friends and family, and she is hopeful to one day qualify to ride at WIHS. “I am honored to be the 2011 Youth Ambassador. It’s something I have wanted for a long time and I look forward to working with the Junior Committee to benefit the show in any way we can,” said Miglarese. In this role, Miglarese will oversee the Junior Committee and work with WIHS to reach out to the local youth of our community. She will help give WIHS a youth perspective as the show develops events from Barn Night to Kids’ Day. "Shannon is no stranger to WIHS and we are very excited to have her join us this year in the official role as Youth Ambassador. She is a wonderful addition to the WIHS team. Her love of horses, knowledge of WIHS and equestrian sport are the perfect combination for this position, said Diana Roday Hosford, Marketing & Community Relations Director, WIHS.